The WV2412.BA0793 TAG Heuer Carrera Automatic Women’s Watch is a classy and sophisticated watch well suited for a day of shopping or an elegant evening out. The TAG Heuer Carrera Automatic’s most prominent attribute is its elegant dial. Featuring either a black opalin or white mother-of-pearl diamond face, the dial is marked by 13 Wesselton diamonds at each hour marker (2 diamonds at the 12 o’clock position). Complementing these features is a polished steel fixed bezel set with 54 top Wesselton diamonds, bringing the total number of diamonds to 67. 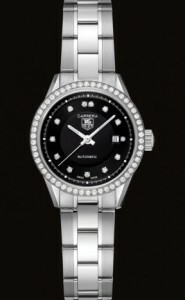 If 67 diamonds seems a tad excessive, the watch can also come with a more modest polished steel fixed bezel. The Carrera Automatic features a stainless steel 27 mm (1.06 in) case and 7 in (17.8 cm) polished bracelet. It has a scratch resistant sapphire crystal, automatic (self-winding) movement, and is water resistant up to 50 meters. Each hand is luminescent and a date window resides next to 3 o’clock. As part of the Carrera collection, TAG Heuer’s Automatic women’s watch displays a high level of elegance and refinement. The watch’s presence is not immediately overstated, but its richly appointed diamonds are sure to grab the attention of those around its wearer.